If all the reporting around the sports world is correct, Michael Nelson Trout is about to become the highest paid athlete in the world — in history. Various outlets, including ESPN reporters, USA Today and the Los Angeles Times, the centerfielder for the Los Angeles Angels of Anaheim will soon sign a contract with the team worth $430 million over 12 years. Doing the math that works out to $35,833,333 per year, or $5,972,222 per month during the regular season, or $221,193 per game. Kind of dwarfs the contracts of A-Rod (Alex Rodriguez) and Giancarlo Stanton. The 27-year-old outfielder with be with the team until he is nearly 40 and would likely end his career, which will take him into the Baseball Hall of Fame, as a designated hitter. Mike Trout has been considered the best player in the Major Leagues for several seasons now, posting up incredible numbers. In his eight Big League years Trout’s career batting average is .307. In 2018 it was .312. In 2016 Trout had his best hitting season with a BA of .316. He also had a total of 240 home runs and 648 RBI. His total number of hits is 1187. In 2013 he had a staggering 190 and in 2018 it was 147. His slash line for 2018 reads: 147 hits, 39 home runs, BA of .312, 79 RBI, OBP (On Base Percentage) .460, SLG (Slugging Percentage) .628 and an OPS of 1.088. Incredible numbers by any standard — and this isn’t even getting deep into the weeds of his stats. There are many more ways to measure how much better he is than the rest of the league. Earlier this year free agent Bryce Harper, who is in the next tier of great players in the game today, signed a deal with the Philadelphia Phillies worth $330 million over 13 years, or $25,384,615 per year. He left behind the Washington Nationals. Infielder Manny Machado signed a deal with the San Diego Padres for $300 million over 10 years. 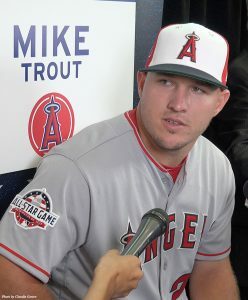 Trout is a native of New Jersey and no doubt shares the same kind of celebrité in his home state as Bruce Springsteen, Jon Bon Jovi and Frank Sinatra. In Anaheim — and Orange County in general — Mike Trout is a favorite son, regardless of where he was born. He is easily the most popular Angel on the team and quite possibly of all time and certainly as popular as Vladimir Guerrero, Rod Carew, Nolan Ryan and Albert Pujols. The communities in and around Anaheim and Millville, NJ where he grew up, will benefit as well. 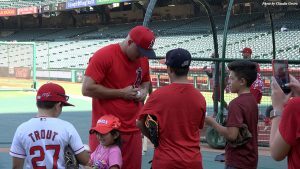 Trout is a big believer in giving back to the community, partnering with the Big Brothers/Big Sisters of Orange County, as well as attending meet and greets for children around California. On April 4 the Angels will have their home opener against the Texas Rangers. When Mike Trout is introduced at the start of the game the crowd will rock Angel Stadium with their thunderous appreciation. Should he hit a home run people in Newport Beach will hear the roar.